Capless fuel fill is now a much more common feature than in years past, when it was a rarity. According to research performed by GM Authority, GM currently offers capless fuel fill on 26 vehicles, including the new Blazer, third-generation Equinox, Corvette, Camaro, Silverado, and Sierra, as well as most Buick, Cadillac, and GMC models. As the capless fueling technology becomes more commonplace and is used more and more by customers, some have begun voicing disapproval of the convenience feature. Stories of various complications can be found on the web, including frozen winter woes, where the flaps are frozen shut. Whose brilliant idea was a capless gas tank??? What about the thousands of people who live on dirt roads? Or even commercials that show all that off-road driving? With no cap, when the nozzle pushes open the little flipper, the dust just falls into the gas tank. I wish engineers would think a little more about country people who actually need trucks and a little less about people who just want a status symbol. We love the Silverado, but a capless gas tank is just silly. Tongue-in-cheek tone aside, we must say that we have not experienced any issues with the capless fuel fill system, even after driving hours on back-country dirt roads in the all-new, 2019 Silverado and Traverse, both of which feature capless fuel fill. As such, we would advise Janet to ensure that the fuel door on her truck is closed, as that would prevent any kind of debris (or dirt) from enter the compartment. Is this what we’ve come to… that removing a gas cap is a big deal? Though we wouldn’t call removing the gas cap “a big deal”, we do appreciate the convenience of not having to do so, especially in a world where saving a few seconds not doing something is a welcome convenience. Have any feedback for Janet or Daryl? Share them in the comments section, below. For more information on capless fuel fill, including a comprehensive list of every GM vehicle equipped with the system, see this link: GM capless fuel fill tech. Also, stay tuned to GM Authority for the latest GM news and GM discussions. The cap thing is more a what if and what could than what really happens. I own two and have not had an issue with either. The one has and overlap on the gas lit that keeps dirt and water out. The other has a rubber gasket on the lid. What many do not know or understand is the flap on the outside has a second inside, it is a double flap system. Also if the seal is broken to let dirt in you would have a light come on for a unsealed gas tank. The odds are greater the gas lid will freeze shut than the inner flap. Even then the nozzle would just free it. If you are not happy with that covers are available if you really need one. Note these systems are in place not for convenience they are to replace issues with caps sealing and setting off check cap warnings we all see. We currently have 2 vehicles with the capless system. a 2016 Tahoe, and a 2017 XT5 (in addition to a previously owned CTS). While there has never been an issue of freezing shut, quite a few times there has been an instance in the Tahoe where in super hot weather, or when the car was sitting in the sun all day the flap was a bit hard to “push down” with the fuel nozzle. I personally like it, but at the same time it is just a bit of a pain in the a$$…..especially when one runs out of fuel and has to use a gas can to fill the tank. When you use a gas can, do you make sure to use the funnel that is provided with the car? I’m pretty sure you did. Mine (2017 Acadia) came with the tire changing kit. Look at page 208 of your manual. 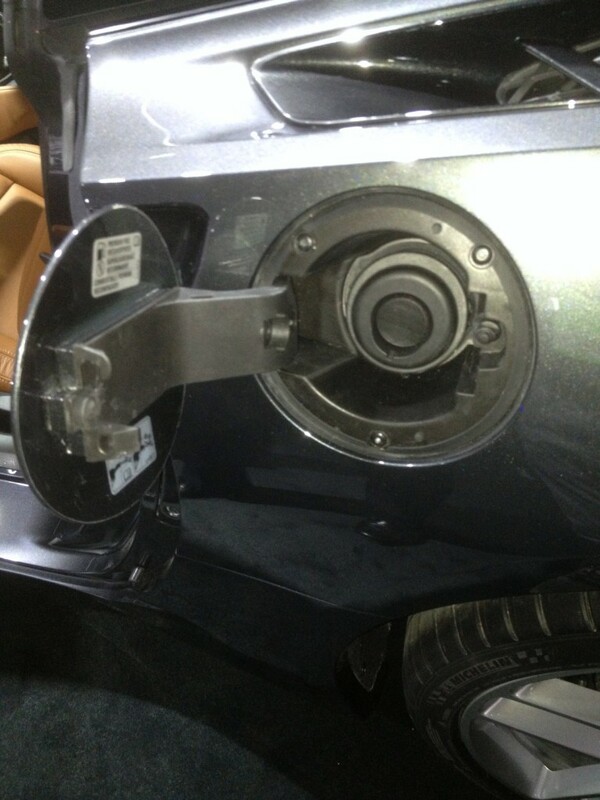 Every GM vehicle equipped with capes fuel fill includes the funnel in question. It’s typically in the compartment that houses the spare and/or the tire inflator kit. If it gets rid of the constant EVAP error codes you get on older model vehicles then thats a good thing. I had to replace my gas cap 3 times on my silverado. state inspection so was not a choice to ignore. I work in a dealer, and own a 17 Silverado with capless fill. I cannot tell you how many times I’ve come across vehicles that a pump will either get stuck in (K2 Silverado’s several of them have done this) or just refuse to allow the fuel to properly flow into. Equinox’s are notorious around here for not allowing the tank to fill completely before clicking off the pump and not allowing you to fill it to full. To be fair I worked at a gas ration in the 80’s and stuck nozzles, fuel cutting off and other fill issues were common. Most fill issues are due to the angles of gill tubes and the sensitivity of nozzles. We had to change nozzles often due to early cut off. Not a GM, but my Grand Cherokee is capless and I haven’t had any issues with it so far. I just wish the filler neck was mounted more securely. As it is, the weight of the nozzle pushes down on the neck, so I have to stand there and keep the weight of the nozzle off of the neck. But this probably has nothing to do with the capless feature. We waste hours screwing around on our phones but somehow we don’t have a few seconds to remove a fuel cap???? Yep, that makes sense. Well its not a time issue to me. But I never liked letting the gas cap (which was attached by a cord in my previous cars) swing against the side of the car, potentially marring the finish in some way. I don’t see this as a time issue, but just as a “why not” issue. Can’t lose it, can’t forget it, and my fingers are less likely to smell of fuel. Seems like a winner, assuming it works. It is working fine for me in my Buick Regal TourX, so I like the feature a lot. 2017 Cadillac CTS Premium Luxury with no gas cap. Love it and have no problems with it, even in the now depths of a Canadian winter. Also had it on my company car – 2016 Malibu Premiere. Again, loved it and had no problems with it. 2017 Cadillac CTS, have had absolutely no issues with the capless fuel fill and actually love not having to wrangle with a gas cap. My 2018 Cadillac CT6 has an issue when filling the tank. The tank will not fill without the nozzle shutting off. I suspect it is not venting properly. Any hints to remedy problem? What I did with my Corvette was to not quite insert nozzle all the way and I rotated it 90* so the handle was to the side. I think that prevented the nozzle sensor from falsely triggering shutoff. It worked fine that way, annoying but it worked. I have a 2014 XTS Premium. I don’t find the lack of a gas cap a major issue, however I think there should be a release inside the car to open it which would be a security measure against the possibility of being vandalized and gas syphon. My Dad was Cadillac man and prior to his demise he had a 2009 DTS fully loaded which had that feature. I wonder why GM has discontinued it? With the capless system if you fill up gas cans to use to fill your vehicle later, the ribs on the can nozzle get stuck on the filler neck by the little door. It is hard to get the can nozzle out because of the way the filler neck is engineered, it gets stuck and is a pain to get free. My 2015 Sting Ray has capless filling. I find this feature convenient and have had no problems at all. the car comes with a special funnel to use with a gas can. Haven’t used that yet. My 2018 Sierra is capless but I wasn’t given a special funnel. I will ask my dealer for it. Thanks. Don’t try to add injector cleaner or a gas can without incerting the “special” spout that comes with the vehicle. How could anybody have a problem with this? We have had no problems on our 2017 GMC Acadia. This an interesting topic , however, because I was filling my tank a few months back and a lady close by was trying to get the gas cap off on what appeared to be a relatively new Mercedes SUV, and it broke. The turn handle part separated from the stopper part, which stayed in the filler neck. She was understandably upset because she couldn’t refuel her vehicle and she told me she was close to empty. I tried to help but to no avail. Obviously, any part can break but I remember thinking how thankful I was to have the capless system on our Acadia. Yeah I’m just worried that the nossle May get stuck in there. It seemed like it wants to hang up in there . I had a problem when the gas pump filler had to big a diameter to open the door. As I understand the system. the larger filling nozzle is for gas that modern cars can’t handle. The smaller nozzle is for modern car engines. If the nozzle is too large, the gas is not for your car engine.